Members of the Whiteoak varsity Cross Country team pose for a photo before practice at Bright Elementary School. 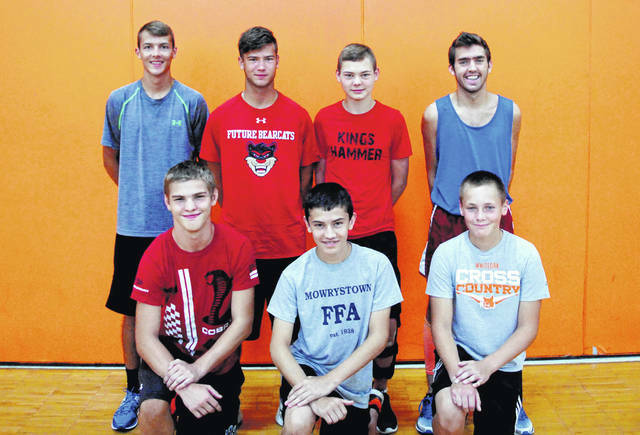 The Whiteoak Cross Country team finished in the top half of the Southern Hills Athletic Conference (SHAC) standings a year ago with a fourth place finish at the SHAC meet. The Wildcats are aiming to improve that finish this season. Wildcats head coach Doug Hughes returns for his 15th season as the head of the Whiteoak Cross Country team and is excited to get the season underway. “Boys team has the potential to be my best team of my 15 year tenure. We will have five experienced seniors leading the way, we’ll go as far as they take us,” said Hughes. Hughes’ team did not lose any runners from last season’s squad and combined the boys and girls teams have a total of six seniors that the coach will rely on this year. “Varsity teams graduated zero last year. Boys team senior laden and girls runners looking to fill out a full team. Lone senior on the girls side is Katie Ames. Katie is a real good kid that I never have to worry about. She will be good to the younger girls on the team,” Hughes said. Whiteoak will have the services of a second all district runner as Atlee Carr returns for his senior season with the team. “Atlee has been one of the top runners for Whiteoak for three years and I expect a big senior season for him,” said Hughes. The Wildcats’ coach also has high expectations for fourth year senior Zach DeAtley in 2018. “Zach has been right there near Hunter and Atlee his first three years and he’s in better shape than normal for this time of the year. Zach could have a real good season,” intimated Hughes. The final two of the five seniors on the boys squad are Logan Cummings and Jacob Campbell and Hughes believes Cummings and Campbell could help push this group of Wildcats over the top. “Cummings and Campbell round out the senior group. Both runners have had solid XC careers and both have the potential to help this group to the next level,” Hughes said. Despite having five seniors on the boys team that he believes will be his top runners during the 2018 season Hughes refuses to put all his eggs in one bucket and has underclassmen that he believes could contribute to the success of the team. “We also have a few freshman through juniors that could challenge and push the top five. I expect a couple of those kids to be running for us at districts and hopefully regionals,” said Hughes. August 22 – The Wildcats will open their season by travelling to Greenfield’s Mitchell Park to take part in the McClain Invitational. The Wildcats will compete against the other four Highland County schools in the event. August 29 – Whiteoak makes the trip west to Lynchburg-Clay to compete in the Mustangs’ home meet and battle for bragging rights against their cross-county rivals. September 11 – The boys and girls from Mowrystown will hold the first of their two home meets of the season at Bright Elementary School. September 18 – Whiteoak will meet all four of their Highland County rivals for the second time as part of the Highland County Meet. October 13 – The Wildcats wrap up their regular season when they compete in the annual SHAC Meet. 2018 may be the year of the Wildcats in the SHAC Cross Country standing. The ability to field five seniors that have been there and done that for four years may give Whiteoak a leg up on the rest of the competition. Expect the Wildcats to be prepared for any situation this season and be as adaptable as any team in the league. Whiteoak has a good shot to improve on their fourth place finish from a year ago and the departure of key talent from schools around the league means they have a high probability of doing just that. https://www.timesgazette.com/wp-content/uploads/sites/33/2018/08/web1_Whiteoak-CC-1.jpgMembers of the Whiteoak varsity Cross Country team pose for a photo before practice at Bright Elementary School.